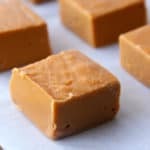 Easy Butterscotch Fudge with 3 Simple Ingredients. Plus this is a no-bake fudge recipe, which is even better. Effortless and delicious! Line an 8" x 8" pan with parchment paper (or foil) and spray with cooking spray. In a medium sized mixing bowl, add the butterscotch chips, sweetened condensed milk, and pinch of salt. Give it a stir and microwave on high for about 50 seconds. Stir and microwave again for 15 seconds. Stir and it should be completely melted. Add vanilla and stir once more. Pour the mixture into the prepared pan. Refrigerate for 2 hours, or until firm. Once the fudge is firm, remove from the pan with the parchment and peel parchment from bottom of fudge. Cut into pieces and enjoy!